A huge yes in my life was when my heart opened to having God’s truth as my guiding counsel. For years I was stuck in an emotional whirlpool, and it wasn’t until I was being sucked under by a wave of desperation that my cry for help changed. Instead of expecting God to fix me, I told him I would do whatever he asked of me. From that time forward my life changed as I stopped talking about what I believed and began living it. It was as if yes unlocked a door within me. And I began a purposed study of God’s Word and how to walk in it. The first thing that I did was get out of bed, get dressed, and start functioning in my home. I began putting others’ needs ahead of my fears, which were multiple, and I created new tapes for my mind. By that I mean my thought life was a tangle of negativity and criticism, so I began to memorize God’s Word to repair misconceptions and maligning attitudes. I was awash in darkened thought cycles, so I chose verses that brought them into the light of truth. “You can’t do anything right,” “Nobody likes you.” It takes effort to change destructive habits, so don’t be disheartened when you slip back into an old pattern. Extend grace and mercy to yourself . . . God does. Then begin again choosing life. 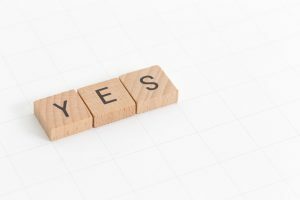 My mental health recovery started with a yes to God and to myself. The Lord invites us to be a part of our recovery. So don’t sit and wait for God to fix you; instead, get up and say yes to the Lord, to the new day, and to yourself. Does that sound too simple? Too Pollyanna? Too rah, rah, shish koom bah? Trust me, I know how hard it is to change a lifestyle, a mindset, and a belief system because I have been in process for almost fifty years. I’ve never worked harder, and I’m still not done. No one is. None of us outgrows our need for assistance. I understand the toil and time involved in the tempering of a heart and the transforming of a mind, and I can say with a resounding yes! that it’s worth the effort. Saying yes to Jesus was the path that led me to personal dignity, integrity, and to believing I had a God-given destiny. By the way, set attainable goals so you don’t position yourself to fail. Don’t sabotage your own progress. Be sure to congratulate yourself for even small steps in the right direction. Be a cheerleader for yourself and others. This will take practice. Yes is a radical word, whether it’s a wedding yes or a Jesus yes. So be rad and go yes your world! Awesome! Perfect encouragement for me today! Thank you, Patsy!! I needed that. There were so many things in my life that showed the Lord’s grace and love for me, yet I ended up blaming myself for everything. Thank you for the words. Love this! Beautiful, encouraging words! Thank you for the words of encouragement. My Dad passed last week and was a change in my life. I like the phrase “get out of bed, get dressed, and start functioning” thank you for those inspiring words. Tomorrow is the first day of the rest of my life. My life verse is in Psalm 139. God reminds me of His love for me. I needed this today and many days! It is like God sent me exactly what I needed to hear. I honestly don’t know how to say yes, and change my way of thinking. But, I am willing to try and figure it out. To spend time in God’s word. But, I am tired and I am always begging God to change me, to save me from myself, but I need to be an active participant. Now is the time to figure it out. Thank you, Patsy, for speaking to my heart and for motivating me to try and change. Very timely for me personally! Boy, this is something I needed to read! Thank you for your transparency for us to see when we fall backwards that it is not unforgivable or unredeemable. Look forward and keep marching forward. As always your words release a peace that comes from God! Thank You Patsy i’ve Been following you since winning Women, when I lived in Michigan and you were giving book reviews. I really needed this encouraging word tonight. Thank you Patsy. Much of my life has been like another episode of the 11 o’clock news. I often wonder how I have survived through it… but I know that God has been beside me and has gone before me each and every step. I know my story needs to be told and I am on a journey to do that. As a high school student I took the F when it was time to do speeches in class… I was so afraid and unable to speak publicly. Over time those ‘news’ events in my life have given me a lot to share and thirty-five years later I am just beginning to find my voice to share them. Thank you for sharing your journey with us.. so that we can embrace our journey’s as well. I love your transparency and encouragement. Thank you Patsy. Awww…I love how God weaves these threads into his beautiful tapestry! Studying about His truth today – and your story lends insight and depth and richness that is palpable. I’ve been on a journey with God for almost a year. Still a long road ahead. Thank you for this sustenance along the way. I needed to hear that I’m not alone when I tell myself I’m not worthy of Gods love. Psalm 139 has also been a pivotal force in my life. As my teaching career was ending a few years early, I was crumbling under pressure and not managing stress. During that school year, I lost too my weight, couldn’t sleep and cried all the time. It was my medical doctor, a precious man, who instead of writing prescriptions for me, wrote, “Read Psalm 139” on a prescription for me! I have a Bible full of his suggestions! My check-ups always include conversations about the power of prayer and God in our lives. God truly works through Dr. Rand Sommer of St. Louis, MO! Wow! I so needed that. I’ve tried and fail so many times. I just keep getting in my own way. Then I beat myself up about it. Yes, I can do this! Yes, I will do this and if I fall…I will get back up and try again. Thank you Patsy! I always love a good dose of the word. Two years ago, my husband died after a 3 year battle with leukemia. Now, I feel like I’m losing myself. It feels as if it’s been two weeks, because I lost an entire year. 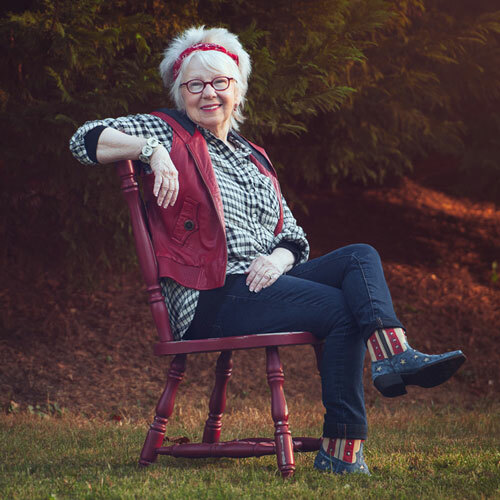 I’ve had trauma-induced PTSD and amnesia.I saw a therapist, a life coach, and I still see a pastoral counselor when I can drag myself there.Although I had an intense conversation with God about death, He has been very present. I have been through so much tragedy, and I believe I have a story to share. I searched but could find no books, and found no one that had shared the things I experienced, and survived to write about it. I want to survive , and use what satan hoped would kill me to be able help someone else. This is awesome. I love these emails. I might need to read the whole book! Thank you! I needed that encouragement. Grateful for God’s love. That was very inspiring. I need to say yes to God more often. ThankYou, for those encouraging words. I feel that’s were I’m at. My current life situation being what it is, I really needed this simple “start here” list this morning. Thank you . Thanks Patsy! I can remember the first time ever hearing you speak at women of faith 15 years ago. I was living new in my faith again and I can remember thinking “I want to be like that when I grow up” meaning… I wanted that love of growing in the Lord and always finding ways to share my journey in ways that made others laugh and lean in (I was already 35). I am almost 50 now and still think it. LOL. I realize now this is a journey toward perfection and I love your vulnerability and your attitude along the way. It helps with perspective. I did become a Pastor and I now share my own journey with others. I try to remember to do it with joy and vulnerability. THANKS again! This is so true. Loved this, thank you. Once again, Jesus speaks to me through your encouraging words. Thank you. Love you. What an inspiration! 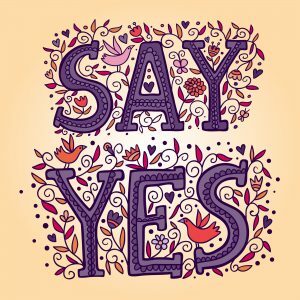 I have printed out the “Yes” image as a daily reminder to always say yes to God! Thank you. Thank you patsy for these kind words. We all need help and encouragement from our Lord and our family and friends! We are loved! How awesome is that? I needed to read this today. Thank you so much! What a lovely surprise to read these encouraging words today! That is so wonderful!!! Thank you!!! You are my hero and have been from the very first time I was you speak back in the early 90’s. You can on stage with a large rubber band and a million small rubber bands attached to it saying they were your emotions and oh how I could relate!!! As always your words touch my heart. Thank you. Your messages mean a lot to me. I loved reading this!! Thank you for sharing your walk and for your honesty!! This gives me hope!! This was a wonderful message and I truly believe that God meant for me to read this today. Thank you for your wisdom and humor and a wonderful way of getting God’s message across. I signed up for your Patsy box, read every book you wrote and think you are such an inspiration for me. That is what my Heart and Soul needed to hear . So many neglect things in this world . But the Greatest Blessing is Yes to Jesus Thank You In Christ Holy Name. You are amazing! When God brought you into my life you were still learning to walk in the truth! Such a blessing to others when we are willing to share victories gained through the power of God’s Word and obedience to it! God has, and is, using you in mighty ways! You are dynamite in a the beautifully wrapped little package! I am fortunate to have Serious in my car. I accidentally ran across Joel Osteen station. It has changed my life. He is so positive and encouraging . If posdible, find him on your computer and TV. You will be affirmed and learn how to change that horrid, critical voice in your head. I also signed up for his daily devotional. Please try it. Also, when you are told you need therapy, try walking first. Fresh air and movement do wonders t I quell that critical spirit! Thanks, Patsy! YES! Yes to change, Yes to learning, Yes to growth. That is huge for me, because I hate change – – – don’t we all? But Lord help us to never be stagnant in our walk with Him. He is like the wind – always on the move and going in and around situations and people. Blessings to you, sister in Christ. He lives! Thank you Patsy! I really needed this today!! Thank you for such encouraging words / I have begun to think of others more than I have!